SUBSTANCE: method of obtaining in solvent mixture of nanoparticles and liquid polymer, synthesised in one reactor, is described, with method containing the following stages: (a) carrying out either polymerisation of first monomer until liquid polymer is obtained, or copolymerisation of first monomer and second monomer until liquid polymer is obtained, in reaction container, where first monomer is selected from group, consisting of C4-C8 -conjugated dienes and their mixtures, and second monomer is selected from group, consisting of styrene, α-methylstyrene, 1-vinylnaphthaline, 2-vinylnaphthaline, 1-α-methylvinylnaphthaline, 2-α-methylvinylnaphthaline, vinyltoluol, methoxystyrene, tert-butoxystyrene and their alkyl, cycloalkyl, aryl, alkaryl and aralkyl derivatives, in which total number of carbon atoms in derivative in not larger than 18, or any di- or tri-substituted aromatic hydrocarbons and their mixtures; (b) partial stop of polymerisation by application of agent for inhibition of active centres; and (c) addition of polyfunctional comonomer, monovinylaromatic monomer and optional loading of polymerisation initiator; where said nanoparticles have core, which includes monovinylaromatic monomer, and shell, including first monomer or first and second monomer, with nanoparticles being formed as a result of self-aggregation into micelles and cross-linking of micelles by polyfunctional comonomer. Also described is method of obtaining caoutchouc composition, with method including: obtaining described above mixture of nanoparticles and liquid polymer and adding mixture to caoutchouc composition. Method of tyre manufacturing with application of nanoparticles and liquid polymer is described, with method including: obtaining described above mixture of nanoparticles and liquid polymer, adding mixture to caoutchouc composition; formation of tyre tread from caoutchouc composition; and constructing tyre with application of said tread. Composition of substances for application on caoutchouc composition, obtained in accordance with method described above, is described. Said composition, in fact, consists of: micellar nanoparticles, belonging to "core-shell" type, where nanoparticles are formed as a result of self-aggregation into micelles and cross-linking of micelles by polyfunctional comonomer; and liquid polymer, which is characterised by Mw value in the range from approximately 10000 to approximately 120000; where nanoparticles are dispersed and mixed inside liquid polymer. EFFECT: simplification of method of obtaining mixture of nanoparticles and liquid polymer and their further processing. Технология, обсуждаемая в настоящем документе, в общем случае относится к каучуковым композициям. The technology discussed herein relates generally to rubber compositions. В частности, она относится к способам синтеза смесей наночастиц и жидкого полимера в одной полимеризационной реакционной емкости. In particular, it relates to methods for the synthesis of mixtures of nanoparticles and liquid polymer in a single polymerization reaction vessel. В соответствии с описанием в примере, продемонстрированном на фигуре 1, каждая из наночастиц, описанных в настоящем документе, образована из группы или собрания нескольких полимерных цепей, которые организованы вокруг центра 1. Полимерные цепи соединяются друг с другом на одном конце на ядре, образованном из сшитых мономерных звеньев в каждой полимерной цепи. In accordance with the description in the example shown in Figure 1, each of the nanoparticles described herein is formed of a group or assembly of several polymer chains that are organized around a center 1. The polymer chains are connected to each other at one end by a nucleus formed from crosslinked monomer units in each polymer chain. Полимерные цепи простираются от ядра 2 наружу, образуя оболочку 3. Оболочка 3 включает мономерные звенья и необязательно сомономерные звенья полимеров, которые не находятся в ядре 2. Необходимо понимать то, что оболочка 3 не ограничивается одним мономерным звеном в каждой полимерной цепи, а может включать несколько мономерных звеньев. The polymer chains extend from the core 2 outwardly to form a shell 3. The shell 3 includes the monomer units and optionally comonomer units of polymers that are not in the core 2. It should be understood that the shell 3 is not limited to a single monomer unit in each polymer chain, but may include a few monomeric units. В дополнение к этому, оболочка 3 может быть разделена на подслои, и подслои могут включать блоки различных гомополимера или сополимера. In addition, the shell 3 may be separated into sublayers, and the sublayers may include blocks of various homopolymer or copolymer. Например, подслой может включать блок рандомизированного стирол-бутадиенового сополимера или гомополимера, такого как бутадиен. For example, a sublayer may include a block of randomized styrene-butadiene copolymer or a homopolymer such as butadiene. Самая внешняя часть слоя оболочки 4 состоит из мономерных звеньев или голов функционально или нефункционально инициированных полимерных цепей в виде внешних концевых групп каждого полимера. The outermost part of the cladding layer 4 is composed of monomer units or functionally or non-functional goals initiated polymer chains in the form of external terminal groups of each polymer. Оболочка 4 представляет собой самую внешнюю часть наночастицы. The shell 4 is the outermost portion of the nanoparticle. Живые полимерные цепи образуют мицеллы вследствие агрегирования ионных концевых групп цепей и химических взаимодействий между полимерными цепями в углеводородном растворителе. The living polymer chains form micelles due to the aggregation of ionic chain end groups and chemical interactions between the polymer chains in hydrocarbon solvent. В случае добавления сшивателя полимерные цепи, образующие мицеллу (мицеллы), становятся сшитыми, и образуется стабильная наночастица (наночастицы). In the case of adding the stapler polymer chains form micelles (micelles) become crosslinked and formed stable nanoparticles (nanoparticle). Наночастицы и жидкие полимеры, подходящие для использования в каучуковых композициях, описываются в патентной заявке США 11/305279, имеющей того же самого заявителя, что и данная, и посредством ссылки включенной в настоящий документ. Nanoparticles and liquid polymers suitable for use in rubber compositions are described in U.S. Patent Application No. 11/305279, having the same Applicant as the present and incorporated by reference herein. Комбинация из наночастицы и жидкого полимера улучшает важные свойства резиновых изделий, таких как покрышки транспортных средств и, в частности, протекторная часть покрышек транспортных средств. The combination of nanoparticle and liquid polymer improves important properties of rubber articles such as tires of vehicles and, in particular, the tread portion of the tires of vehicles. Например, при добавлении наночастиц и жидких полимеров могут быть улучшены сцепление протектора покрышки с мокрым/сухим дорожными покрытиями и сопротивление его качению при одновременном сохранении хорошего усиления для обеспечения долговечности протектора. For example, adding nanoparticles and liquid polymers can be improved grip tire tread with a wet / dry road surfaces and its rolling resistance, while maintaining good gain for tread durability. Желательными являются уменьшение или исключение количества технологических масел, использующихся в композиции для покрышек транспортных средств, и это становится возможным при использовании в таких композициях комбинации из наночастиц и жидкого полимера. It is desired to reduce or eliminate the number of process oil used in the composition for tires of vehicles, and this is possible when using such compositions in combination of nanoparticles and liquid polymer. Однако при синтезе и переработке ранее описанных наночастиц и жидких полимеров встречаются трудности. However, the synthesis and processing of the previously described nanoparticles and liquid polymers encountered difficulties. Ранее известные способы включают раздельный синтез наночастиц и жидкого полимера, раздельное их высушивание, а после этого раздельное добавление каждого компонента в каучуковую композицию. Previously known methods include separate synthesis of nanoparticles and liquid polymer, drying them separately, and then separately adding each component into a rubber composition. Проблемы с переработкой происходят от того, что жидкий полимер представляет собой высоковязкое вещество, которое очень трудно удалять из растворителя и высушивать. Problems occur with the processing of that liquid polymer is a highly viscous substance that is very difficult to remove from solvent and dry. В дополнение к этому, наночастицы и жидкий полимер хранят раздельно, тем самым, занимая ценные складские помещения. In addition, the nanoparticles and liquid polymer are stored separately, thereby taking up valuable storage space. Технология, описанная в настоящем документе, предлагает синтез наночастиц и жидкого полимера в одной и той же реакционной емкости без удаления либо наночастиц, либо жидкого полимера (здесь и далее в настоящем документе «однореакторный синтез»). The technology described herein provides a synthesis of nanoparticles and liquid polymer in the same reaction vessel without removal of either the nanoparticles or liquid polymer (hereinafter herein, "one-pot synthesis"). В сопоставлении с отдельно синтезируемым жидким полимером получающуюся в результате смесь легче перерабатывать и высушивать. In comparison with a separately synthesized liquid polymer of the resulting mixture is easier to process and dry. Смесь также облегчает диспергирование наночастиц в каучуковой композиции. The mixture also facilitates dispersion of the nanoparticles in a rubber composition. Одним дополнительным преимуществом является экономия складских помещений для смеси наночастицы/жидкий полимер в сопоставлении с индивидуальными компонентами. One additional advantage is the saving of storage space for the mixture nanoparticle / liquid polymer as compared with the individual components. Способ проведения однореакторного синтеза смеси наночастиц и жидкого полимера включает проведение полимеризации первого мономера и необязательно второго мономера в углеводородном растворителе до получения жидкого полимера. A method for conducting a one-pot synthesis of a mixture of nanoparticles and liquid polymer includes carrying out the polymerization of the first monomer and optionally a second monomer in a hydrocarbon solvent to obtain a liquid polymer. Полимеризацию частично гасят или обрывают при использовании агента гашения активных центров. The polymerization is partially quenched or terminated using active centers quenching agent. Агент гашения активных центров также может быть назван агентом обрыва, и данные термины в настоящем документе используются взаимозаменяющим образом. Quenching agent active centers may also be called an open agent, and these terms are herein used interchangeably. После этого проводят добавление загрузки инициатора полимеризации, сшивателя и моновинилароматического мономера. This is followed by addition of polymerization initiator, monovinylaromatic monomer and crosslinker. Это дополнительно инициирует полимеризацию, благодаря чему «по месту» образуются наночастицы, имеющие ядро, включающее множество винилароматических мономеров, и оболочку, включающую первый мономер или первый мономер и второй мономер. This initiates further polymerization whereby "place" form nanoparticles having a core comprising a plurality of vinyl aromatic monomer and a shell comprising the first monomer or the first monomer and second monomer. Композиция веществ по существу состоит из смеси наночастиц, относящихся к типу ядро-оболочка, и жидкого полимера. The composition of matter consists essentially of a mixture of nanoparticles pertaining to the type of core-shell polymer and liquid. Внутри жидкого полимера наночастицы диспергируются и перемешиваются. Inside the liquid polymer nanoparticles are dispersed and mixed. Смеси наночастиц и жидкого полимера, полученные по способам, описанными в настоящем документе, могут быть добавлены в каучуковые композиции для получения каучуковой композиции, содержащей наночастицы/жидкий полимер. Mixtures of nanoparticles and liquid polymer obtained by the methods described herein, can be added to rubber compositions for the rubber composition containing the nanoparticle / liquid polymer. В качестве одного примера покрышка, которая включает каучуковую композицию, содержащую наночастицы/жидкий полимер, может быть получена при использовании протектора покрышки, содержащего каучуковую композицию, и конструировании покрышки с использованием данного протектора покрышки. As one example of the tire which comprises a rubber composition comprising a nanoparticle / liquid polymer can be obtained using a tire tread, comprising a rubber composition, and constructing a tire using the tread of the tire. Фигура 1 демонстрирует схему одного примера наночастиц. Figure 1 shows a diagram of one example of nanoparticles. Фигура 2 демонстрирует резиновое изделие, характеризующееся улучшенным усилением и контролируемым гистерезисом, в одном варианте реализации настоящего изобретения. Figure 2 shows a rubber article characterized by improved reinforcement and controllable hysteresis in an embodiment of the present invention. В настоящем документе описываются способы проведения однореакторного синтеза для получения смеси наночастиц и жидкого полимера. This document describes how to conduct a one-pot synthesis to produce a mixture of nanoparticles and liquid polymer. Первый иллюстративный способ включает полимеризацию до получения жидкого полимера, где в реакционной емкости в углеводородном растворителе полимеризуют первый мономер и необязательно второй мономер. The first illustrative method involves polymerization to obtain a liquid polymer, wherein a reaction vessel is polymerized in a hydrocarbon solvent, the first monomer and optionally a second monomer. Полимеризации дают возможность протекать, а после этого ее частично гасят (обрывают) при использовании агента гашения активных центров. Polymerization was allowed to proceed, and then it partially quenched (terminated) by using active centers quenching agent. Количество подвергшихся обрыву полимерных цепей может варьироваться в соответствии с областью применения. Number undergone breakage of polymer chains can vary according to the application. Количество подвергшихся обрыву полимерных цепей может составлять приблизительно 1-99% (масс.) при расчете на совокупную массу полимерных цепей в реакционной емкости, в альтернативном варианте приблизительно 15-85% (масс.) или в альтернативном варианте приблизительно 30-75% (масс.). Number undergone breakage of the polymer chains may be about 1-99% (wt.) Based on the total weight of the polymer chains in the reaction vessel, alternatively about 15-85% (wt. ), Or alternatively about 30-75% (wt )..
В рамках части данного примера способа на второй стадии в реакционную емкость, содержащую жидкий полимер, проводят добавление инициатора полимеризации и смеси сшивателя и моновинилароматического мономера. Within this part of the example of the method in the second step, the reaction vessel containing the liquid polymer is carried out adding a polymerization initiator and mixtures of monovinylaromatic monomer and crosslinker. На данной стадии живые полимерные цепи, остающиеся после стадии синтеза жидкого полимера, сополимеризуются с моновинилароматическим мономером. In this step, living polymer chains remaining from the liquid polymer synthesis step, are copolymerized with the monovinyl aromatic monomer. Получающиеся в результате сополимеры в углеводородном растворителе агрегируются в мицеллярные структуры. The resulting copolymer in a hydrocarbon solvent are aggregated into micelle structures. Сшиватель исполняет функцию сшивания мицелл, что в результате приводит к получению наночастиц. Stapler performs stapling micelles, which results in the production of nanoparticles. В соответствии с использованием в настоящем документе, если только не будет указано другого, загрузка или добавление материала, в том числе мономера, в реакционную емкость могут быть одновременными или постадийными. As used herein, unless otherwise indicated, loading or addition of material, including monomer, into the reaction vessel may be simultaneous or stepwise. Постадийность обозначает то, что либо добавление одного ингредиента завершают до начала добавления другого ингредиента, либо добавление одного ингредиента начинают (но необязательно завершают) до добавления другого ингредиента. Stepwise denotes that either the addition of one ingredient is completed before the start of the addition of another ingredient, or addition of one ingredient starts in (but not necessarily completed) before the addition of another ingredient. Второй иллюстративный способ включает описанную ранее стадию жидкой полимеризации. A second exemplary method includes the previously described liquid polymerization step. Однако в данном способе процесс синтеза наночастиц отличается тем, что имеет место постадийное добавление моновинилароматического мономера, после чего в реактор проводят добавление сшивателя и инициатора. However, in this method the nanoparticle synthesis process differs in that there is a staged addition of a monovinyl aromatic monomer, whereupon the reactor is carried out the addition of crosslinker and initiator. Получающиеся в результате сополимеры в углеводородном растворителе самоагрегируются в мицеллы, относящиеся к типу ядро-оболочка, а сшиватель исполняет функцию сшивания мицелл, что в результате приводит к получению наночастиц. The resulting copolymers self-assemble in the hydrocarbon solvent into micelles of the type core-shell, and the stapler function takes crosslinking micelles resulting in nanoparticles receivable. Наночастицы, которые в результате получают по первому способу и второму способу, могут обладать различными физическими свойствами. The nanoparticles that result obtained by the first method and the second method, may have different physical properties. В подобных условиях первый способ в результате приводит к получению полимерных наночастиц, имеющих относительно менее плотно сшитое ядро, но характеризующихся сшиванием по всему ядру, в то время как второй способ в результате приводит к получению полимерных наночастиц, имеющих ядро, плотно сшитое в центре ядра. Under such conditions, the first method results in the production of polymer nanoparticles having relatively less densely crosslinked core, but characterized by stitching around the core, while the second method results in the production of polymer nanoparticles having a core of tightly stitched in the center of the core. Плотность сшивания может быть определена как количество сшивок на один мономер (Xd). cross-linking density can be defined as the number of crosslinks per monomer (Xd). В одном примере, в котором наночастица содержит стирол и дивинилбензол (ДВБ), Xd определяют по соотношению между молями ДВБ и молями ДВБ и стирола. In one example, wherein the nanoparticle comprises styrene and divinyl benzene (DVB), Xd is determined by the ratio between the moles of DVB and moles of DVB and styrene. Данное количество может находиться в диапазоне от 0,01 до 1, например, от 0,1 до 0,8, таком как от 0,2 до 0,4. This amount may range from 0.01 to 1, e.g., from 0.1 to 0.8, such as 0.2 to 0.4. В описанном ранее примере первого способа плотность сшивания может составлять 0,2-0,4, например, 0,3, а в описанном ранее примере второго способа плотность сшивания может составлять 0,8-1,0, например, 0,9. In the previously described first example, the crosslinking density may be 0.2-0.4, for example 0.3, and in the previously described example of the second method of cross-linking density may be 0.8-1.0, for example 0.9. Способы однореакторного синтеза, описанные в настоящем документе, приводят к получению смеси наночастицы/жидкий полимер, которую легче перерабатывать и высушивать в сопоставлении с раздельным синтезом данных материалов. Pot synthesis methods described herein, result in a mixture nanoparticle / liquid polymer that is easier to process and dry compared to the separate synthesis of these materials. Получающиеся в результате смеси также экономят и складские помещения для производителей продуктов, включающих такие смеси. The resulting mixture, and also save storage space for manufacturers of products incorporating such blends. Первая стадия описанных ранее способов в результате приводит к полимеризации до получения жидкого полимера. The first stage of the ways described earlier results in a polymerization to obtain a liquid polymer. Для начала полимеризации мономера (мономеров) в реакционную емкость добавляют первый мономер и необязательно второй мономер совместно с анионным инициатором, что в результате приводит к получению жидкого полимера. To start the polymerization of the monomer (monomers) is added to the reaction vessel first monomer and a second monomer optionally together with an anionic initiator that results in a liquid polymer. Жидкий полимер может включать гомополимер, такой как полибутадиен, или сополимер, такой как сополимер стирола-бутадиена. The liquid polymer may comprise a homopolymer, such as polybutadiene, or a copolymer such as styrene-butadiene copolymer. Первым мономером может являться любой мономер, способный подвергаться анионной полимеризации. The first monomer may be any monomer capable of undergoing anionic polymerization. Первый мономер может быть выбран из одного или нескольких сопряженных диеновых мономеров, В одном варианте реализации первый мономер выбирают из C 4 -C 8 сопряженных диеновых мономеров. The first monomer may be selected from one or more conjugated diene monomers, In one embodiment, the first monomer is selected from C 4 -C 8 conjugated diene monomers. Конкретные примеры сопряженных диеновых мономеров включают нижеследующие, но не ограничиваются только этими: 1,3-бутадиен, изопрен (2-метил-1,3-бутадиен), цис- и транс-пиперилен (1,3-пентадиен), 2,3-диметил-1,3-бутадиен, 1,3-пентадиен, цис- и транс-1,3-гексадиен, цис- и транс-2-метил-1,3-пентадиен, цис- и транс-3-метил- 1,3-пентадиен, 4-метил-1,3-пентадиен, 2,4-диметил-1,3-пентадиен и тому подобное и их смеси. Specific examples of conjugated diene monomers include, but are not limited to, 1,3-butadiene, isoprene (2-methyl-1,3-butadiene), cis and trans-piperylene (1,3-pentadiene), 2,3 dimethyl-1,3-butadiene, 1,3-pentadiene, cis- and trans-1,3-hexadiene, cis- and trans-2-methyl-1,3-pentadiene, cis- and trans-3-methyl- 1,3-pentadiene, 4-methyl-1,3-pentadiene, 2,4-dimethyl-1,3-pentadiene and the like and mixtures thereof. В примерах вариантов реализации в качестве сопряженного диенового мономера (мономеров) используют изопрен или 1,3-бутадиен или их смеси. In the examples of embodiments as the conjugated diene monomer (s) using isoprene or 1,3-butadiene or mixtures thereof. Необязательный второй мономер может являться винилароматическим мономером и может быть выбран из группы, состоящей из стирола, этилвинилбензола, α-метилстирола, 1-винилнафталина, 2-винилнафталина, винилтолуола, метоксистирола, трет-бутоксистирола и тому подобного; The optional second monomer may be a vinyl aromatic monomer and may be selected from the group consisting of styrene, ethylvinylbenzene, α-methylstyrene, 1-vinylnaphthalene, 2-vinylnaphthalene, vinyl toluene, methoxystyrene, t-butoxystyrene, and the like; а также их алкильных, циклоалкильных, арильных, алкарильных и аралкильных производных, у которых совокупное количество атомов углерода в мономере в общем случае является не большим, чем приблизительно 20; as well as alkyl, cycloalkyl, aryl, alkaryl and aralkyl derivatives thereof in which the total number of carbon atoms in the monomer is generally not greater than about 20; и их смесей. and mixtures thereof. В примерах вариантов реализации сопряженный диеновый мономер и винилароматический мономер обычно используют при массовых соотношениях в диапазоне от приблизительно 99:1 до приблизительно 1:99 или от приблизительно 30:70 до приблизительно 90:10 или от приблизительно 85:15 до приблизительно 60:40. In the examples of embodiments the conjugated diene monomer and vinyl aromatic monomer typically used in weight ratios ranging from about 99: 1 to about 1:99 or from about 30:70 to about 90:10 or from about 85:15 to about 60:40. В одном или нескольких вариантах реализации использующимся анионным инициатором является функциональный инициатор, который вводит функциональную группу в голову полимерной цепи (то есть, местоположение, с которого начинается полимерная цепь). In one or more embodiments uses a functional anionic initiator is an initiator which introduces a functional group at the head of the polymer chain (i.e., the location at which to begin the polymer chain). В определенных вариантах реализации функциональная группа включает один или несколько гетероатомов (например, атомов азота, кислорода, бора, кремния, серы, олова и фосфора) или гетероциклических групп. In certain embodiments, the functional group includes one or more heteroatoms (e.g., nitrogen, oxygen, boron, silicon, sulfur, tin, and phosphorus) or heterocyclic groups. Примеры анионных инициаторов включают литийорганические соединения. Examples of anionic initiators include organolithium compounds. В одном или нескольких вариантах реализации литийорганические соединения могут содержать гетероатомы. In one or more embodiments, organolithium compounds may include heteroatoms. В данных или других вариантах реализации литийорганические соединения могут иметь одну или несколько гетероциклических групп. In these or other embodiments, organolithium compounds may include one or more heterocyclic groups. Типы литийорганических соединений включают алкиллитий, соединения ариллития и соединения циклоалкиллитая. Types of organolithium compounds include alkyllithium, aryllithium compounds and tsikloalkillitaya compound. Конкретные примеры литийорганических соединений включают этиллитий, н-пропиллитий, изопропиллитий, н-бутиллитий, втор-бутиллитий, трет-бутиллитий, н-амиллитий, изоамиллитий и фениллитий. Specific examples of organolithium compounds include ethyllithium, n-propyl, isopropyllithium, n-butyllithium, sec-butyllithium, tert-butyllithium, n-amillity, izoamillity and phenyllithium. Другие примеры включают соединения алкилмагнийгалогенида, такие как бутилмагнийбромид и фенилмагнийбромид. Other examples include a halide of magnesium alkyl compounds such as butylmagnesium bromide and phenylmagnesium bromide. Другие анионные инициаторы включают натрийорганические соединения, такие как фенилнатрий и 2,4,6-триметилфенилнатрий. Other anionic initiators include organosodium compounds such as phenyl sodium and 2,4,6-trimetilfenilnatry. Также предусматриваются и такие анионные инициаторы, которые приводят к получению полимеров, имеющих две живые группы, у которых обе концевые группы полимерной цепи являются живыми. Also provided are those anionic initiators that result in polymers having two living groups, in which both end groups of the polymer chain is living. Примеры таких инициаторов включают дилитиевые инициаторы, такие как те, которые получают в результате проведения реакции между 1,3-диизопропенилбензолом и втор-бутиллитием. Examples of such initiators include dilithium initiators such as those prepared by the reaction of 1,3-diisopropenylbenzene and sec-butyllithium. Данные и родственные бифункциональные инициаторы описываются в патенте США №3652516, который посредством ссылки включается в настоящий документ. These and related difunctional initiators are disclosed in U.S. Patent №3652516, which is incorporated by reference herein. Также могут быть использованы и анион-радикальные инициаторы, в том числе те, которые описываются в патенте США №5552483, который посредством ссылки включается в настоящий документ. May also be used and the anion-radical initiators, including those described in U.S. Patent №5552483, which is incorporated by reference herein. В конкретных вариантах реализации литийорганические соединения включают циклическое аминсодержащее соединение, такое как литиогексаметиленимин. In specific embodiments, the organolithium compounds include a cyclic amine-containing compound such as litiogeksametilenimin. Данные и родственные подходящие инициаторы описываются в патентах США №№5332810, 5329005, 5578542, 5393721, 5698646, 5491230, 5521309, 5496940, 5574109 и 5786441, которые посредством ссылки включаются в настоящий документ. These and related Suitable initiators are described in U.S. Pat №№5332810, 5,329,005, 5,578,542, 5,393,721, 5,698,646, 5,491,230, 5,521,309, 5,496,940, 5,574,109 and 5,786,441, which are incorporated by reference herein. В других вариантах реализации литийорганические соединения включают алкилтиоацетали, такие как 2-литио-2-метил-1,3-дитиан. In other embodiments, the organolithium compounds include alkiltioatsetali such as 2-lithio-2-methyl-1,3-dithiane. Данные и родственные подходящие инициаторы описываются в публикациях США №№2006/0030657, 2006/0264590 и 2006/0264589, которые посредством ссылки включаются в настоящий документ. These and related suitable initiators are described in US publications №№2006 / 0030657, 2006/0264590 and 2006/0264589, which are incorporated by reference herein. В других вариантах реализации литийорганические соединения включают алкоксисилилсодержащие инициаторы, такие как литиированный трет-бутилдиметилпропоксисилан. In other embodiments, the organolithium compounds include alkoksisililsoderzhaschie initiators, such as lithiated t-butildimetilpropoksisilan. Данные и родственные подходящие инициаторы описываются в публикации США №2006/0241241, которая посредством ссылки включается в настоящий документ. These and related Suitable initiators are described in U.S. №2006 / 0241241, which is incorporated by reference herein. В одном или нескольких вариантах реализации использованным анионным инициатором является соединение триалкилоловолития, такое как три-н-бутилоловолитий. In one or more embodiments, the anionic initiator is used trialkilolovolitiya compound such as tri-n-butilolovolity. Данные и родственные подходящие инициаторы описываются в патентах США №№3426006 и 5268439, которые посредством ссылки включаются в настоящий документ. These and related Suitable initiators are described in U.S. Patents 5,268,439 and №№3426006 which by reference are incorporated herein. Необязательно стадия синтеза жидкого полимера может быть проведена в присутствии модификатора или регулятора 1,2-микроструктуры для того, чтобы, например, увеличить скорость реакции, уравновесить соотношение реакционных способностей мономеров и/или отрегулировать 1,2-микроструктуру у сопряженных диеновых мономеров. Optionally, the liquid polymer synthesis step may be conducted in the presence of a modifier or regulator of 1,2-microstructure in order to, for example, increase the reaction rate, to balance the ratio of reactivities of monomers and / or adjust the 1,2-microstructure in the conjugated diene monomers. Подходящие модификаторы включают нижеследующие, но не ограничиваются только этими: триэтиламин, три-н-бутиламин, триамид гексаметилфосфорной кислоты, N,N,N',N'-тетраметилэтилендиамин, диметиловый эфир этиленгликоля, диметиловый эфир диэтиленгликоля, диметиловый эфир триэтиленгликоля, диметиловый эфир тетраэтиленгликоля, тетрагидрофуран, 1,4-диазабицикло[2.2.2]октан, диэтиловый эфир, три-н-бутилфосфин, п-диоксан, 1,2-диметоксиэтан, диметиловый эфир, метилэтиловый эфир, этилпропиловый эфир, ди-н-пропиловый эфир, ди-н-октиловый эфир, анизол, дибен Suitable modifiers include, but are not limited to, triethylamine, tri-n-butylamine, hexamethylphosphoric acid triamide, N, N, N ', N'-tetramethylethylene diamine, ethylene glycol dimethyl ether, diethylene glycol dimethyl ether, triethylene glycol dimethyl ether, tetraethylene glycol dimethyl ether tetrahydrofuran, 1,4-diazabicyclo [2.2.2] octane, diethyl ether, tri-n-butylphosphine, p-dioxane, 1,2-dimethoxyethane, dimethyl ether, methyl ethyl ether, ethyl propyl ether, di-n-propyl ether, di-n-octyl ether, anisole, diben иловый эфир, дифениловый эфир, диметилэтиламин, бисоксоланилпропан, три-н-пропиламин, триметиламин, триэтиламин, N,N-диметиланилин, N-этилпиперидин, N-метил-N-этиланилин, N-метилморфолин, тетраметилендиамин, олигомерные оксоланилпропаны (ООП), 2,2-бис(4-метилдиоксан), бистетрагидрофурилпропан и тому подобное. yl ether, diphenyl ether, dimethylethylamine, bisoksolanilpropan, tri-n-propylamine, trimethylamine, triethylamine, N, N-dimethylaniline, N-ethylpiperidine, N-methyl-N-ethylaniline, N-methylmorpholine, tetramethylenediamine, oligomeric oksolanilpropany (PLO) 2,2-bis (4-metildioksan) bistetragidrofurilpropan and the like. R 16 , R 17 , R 18 и R 19 независимо представляют собой водород или C 1 -С 6 алкильную группу; R 16, R 17, R 18 and R 19 independently represent hydrogen or C 1 -C 6 alkyl group; у представляет собой целое число в диапазоне от 1 до 5 включительно, az представляет собой целое число в диапазоне от 3 до 5 включительно. y is an integer ranging from 1 to 5 inclusive, az is an integer ranging from 3 to 5 inclusive. Конкретные примеры модификаторов или регуляторов 1,2-микроструктуры включают нижеследующие, но не ограничиваются только этими: олигомерные оксоланилпропаны (ООП); Specific examples of modifiers or 1,2-microstructure regulators include, but are not limited to, oligomeric oksolanilpropany (PLO); 2,2-бис(4-метилдиоксан); 2,2-bis (4-metildioksan); бис(2-оксоланил)метан; bis (2-oxolanyl) methane; 1,1-бис(2-оксоланил)этан; 1,1-bis (2-oxolanyl) ethane; бистетрагидрофурилпропан; bistetragidrofurilpropan; 2,2-бис(2-оксоланил)пропан; 2,2-bis (2-oxolanyl) propane; 2,2-бис(5-метил-2-оксоланил)пропан; 2,2-bis (5-methyl-2-oxolanyl) propane; 2,2-бис-(3,4,5-триметил-2-оксоланил)пропан; 2,2-bis- (3,4,5-trimethyl-2-oxolanyl) propane; 2,5-бис(2-оксоланил-2-пропил)оксолан; 2,5-bis (2-oxolanyl-2 -propyl) oxolane; октаметилпергидроциклотетрафурфурилен (циклический тетрамер); oktametilpergidrotsiklotetrafurfurilen (cyclic tetramer); 2,2-бис(2-оксоланил)бутан; 2,2-bis (2-oxolanyl) butane; и тому подобное. etc. Также может быть использована и смесь двух и более модификаторов или регуляторов 1,2-микроструктуры. It may also be used and a mixture of two or more modifiers or 1,2-microstructure regulators. После предоставления реакции времени для прохождения до получения жидкого полимера добавляют агент гашения активных центров в таком количестве, которое в результате приводит к частичному гашению (обрыву) живого полимера. After allowing the reaction time to pass until a liquid polymer is added the active centers quenching agent in such an amount that results in partial quenching (breakage) of the living polymer. В результате частичного обрыва живые (не подвергшиеся обрыву) полимеры сохраняются и впоследствии сополимеризуются с образованием оболочки наночастиц на последующей стадии синтеза наночастиц. As a result, partial breakage living (not subjected to breakage) and subsequently stored polymers copolymerize to form a shell on the nanoparticles subsequent nanoparticle synthesis step. Стадия синтеза жидкого полимера протекает относительно быстро и может, например, быть завершена приблизительно за 15 минут. Step liquid polymer synthesis proceeds relatively quickly and can, for example, be completed in about 15 minutes. В соответствии с использованием в настоящем документе частичный обрыв обозначает обрыв для менее чем 100% от живых полимерных цепей. As used herein denotes partial break open for less than 100% of the living polymer chains. Подходящие агенты гашения активных центров включают нижеследующие, но не ограничиваются только этими: спирты, такие как метанол, этанол, пропанол и изопропанол. Suitable active centers quenching agents include, but are not limited to: alcohols such as methanol, ethanol, propanol and isopropanol. Необязательно агент гашения активных центров может быть использован и для введения концевой функциональности. Optionally the active centers quenching agent may be used to introduce terminal functionality. Примеры агентов гашения активных центров, вводящих функциональность, включают нижеследующие, но не ограничиваются только этими: SnCl 4 , R 3 SnCl, R 2 SnCl 2 , RSnCl 3 , карбодиимиды, N-метилпирролидин, циклические амиды, циклические мочевины, изоцианаты, основания Шиффа, 4,4'-бис(диэтиламино)бензофенон, N,N'-диметилэтиленмочевина и их смеси, где R выбирают из группы, состоящей из алкилов, содержащих от приблизительно 1 до приблизительно 20 атомов углерода, циклоалкилов, содержащих от приблизительно 3 до приблизительно 20 атомов углерода, арилов, содержащих от пр Examples of introducing functionality of active sites quenching agents include, but are not limited to: SnCl 4, R 3 SnCl, R 2 SnCl 2, RSnCl 3, carbodiimides, N-methylpyrrolidine, cyclic amides, cyclic ureas, isocyanates, Schiff bases, 4,4'-bis (diethylamino) benzophenone, N, N'-dimethylethyleneurea, and mixtures thereof, wherein R is selected from the group consisting of alkyl groups containing from about 1 to about 20 carbon atoms, cycloalkyls having from about 3 to about 20 carbon atoms, aryls having from straight близительно 6 до приблизительно 20 атомов углерода, аралкилов, содержащих от приблизительно 7 до приблизительно 20 атомов углерода, и их смесей. blizitelno 6 to about 20 carbon atoms, aralkyls having from about 7 to about 20 carbon atoms and mixtures thereof. Жидкий полимер может быть получен по периодическому, полупериодическому или непрерывному способам. The liquid polymer may be prepared in batch, semi-batch or continuous processes. Обычно используют углеводородный растворитель несмотря, может быть, на возможность использования и других растворителей или комбинаций растворителей при том условии, что растворитель/комбинация не будут оказывать помех образованию мицелл. Typically used hydrocarbon solvent although, perhaps, the possibility of using other solvents or combinations of solvents, provided that the solvent / combination would not cause interference to the formation of micelles. Углеводородный растворитель может быть выбран из любых подходящих алифатических углеводородов, алициклических углеводородов или их смеси при том условии, что во время полимеризации он будет находиться в жидком состоянии. The hydrocarbon solvent can be selected from any suitable aliphatic hydrocarbons, alicyclic hydrocarbons or mixtures thereof with the proviso that during the polymerization it will be in the liquid state. Примеры алифатических углеводородов включают нижеследующие, но не ограничиваются только этими: пентан, изопентан, 2,2-диметилбутан, гексан, гептан, октан, нонан, декан, смеси таких углеводородов и тому подобное. Examples of aliphatic hydrocarbons include, but are not limited to, pentane, isopentane, 2,2-dimethylbutane, hexane, heptane, octane, nonane, decane, mixtures of such hydrocarbons and the like. Примеры алициклических углеводородов включают нижеследующие, но не ограничиваются только этими: циклопентан, метилциклопентан, циклогексан, метилциклогексан, циклогептан, циклооктан, циклононан, циклодекан и тому подобное. Examples of alicyclic hydrocarbons include, but are not limited to, cyclopentane, methylcyclopentane, cyclohexane, methylcyclohexane, cycloheptane, cyclooctane, cyclononane, cyclodecane and the like. В одном варианте реализации жидкая углеводородная среда содержит гексаны. In one embodiment, the liquid hydrocarbon medium comprises hexanes. В соответствии со способом, описанным в настоящем документе, определенные преимущества имеются у синтеза жидкого полимера по периодическому способу. In accordance with the method described herein, certain advantages are liquid at the synthesis of the polymer by a batch process. Однако, методику, описанную в настоящем документе, также можно реализовать в одной реакционной емкости и по непрерывному способу. However, the technique described herein may also be implemented in a single reaction vessel and a continuous process. В непрерывном способе мономеры и инициатор совместно с растворителем подают в реакционную емкость непрерывно. In a continuous process the monomers and initiator together with a solvent is fed to the reaction vessel continuously. Давление в реакционной емкости должно быть достаточным для сохранения по существу жидкой фазы в условиях проведения реакции полимеризации. The pressure in the reaction vessel should be sufficient to maintain a substantially liquid phase under the conditions of the polymerization reaction. В общем случае в течение всей полимеризации реакционная среда может выдерживаться при температуре, которая находится в пределах диапазона от приблизительно 20°C до приблизительно 140°С. 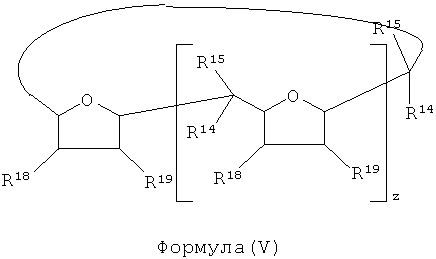 In general, throughout the polymerization reaction medium can be maintained at a temperature which is within the range of from about 20 ° C to about 140 ° C.
Жидкий полимер может включать полиизопрен, полибутадиен, стирол-бутадиеновый сополимер, стирол-изопрен-бутадиеновый сополимер, стирол-изопреновый сополимер, бутадиен-изопреновый сополимер, жидкий бутилкаучук, жидкий неопрен, этилен-пропиленовый сополимер, этилен-пропилен-диеновый сополимер, акрилонитрил-бутадиеновый сополимер, жидкий силикон, этилен-акриловый сополимер, этилен-винилацетатный сополимер, жидкий эпихлоргидриновый, жидкий хлорированный полиэтиленовый, жидкий хлорсульфированный полиэтиленовый каучуки, жидкий гидриров The liquid polymer may comprise polyisoprene, polybutadiene, styrene-butadiene copolymer, styrene-isoprene-butadiene copolymer, styrene-isoprene copolymer, butadiene-isoprene copolymer, liquid butyl rubber, liquid neoprene, ethylene-propylene copolymer, ethylene-propylene-diene copolymer, acrylonitrile- butadiene copolymer, liquid silicone, ethylene acrylic copolymer, ethylene-vinyl acetate copolymer, liquid epichlorohydrin, liquid chlorinated polyethylene, liquid chlorosulfonated polyethylene rubbers, liquid hydrogenated анный нитрильный каучук, жидкий тетрафторэтилен-пропиленовый каучук, жидкие гидрированный полибутадиен и стирол-бутадиеновый сополимер и тому подобное и их смесь. anny nitrile rubber, liquid tetrafluoroethylene-propylene rubber, liquid hydrogenated polybutadiene and styrene-butadiene copolymer and the like and mixtures thereof. В одном варианте реализации среднечисленная молекулярная масса (Mn) получающегося в результате жидкого полимера находится в пределах диапазона от приблизительно 10000 до приблизительно 120000, в пределах диапазона от приблизительно 20000 до приблизительно 110000 или в пределах диапазона от приблизительно 25000 до приблизительно 75000. Средневесовая молекулярная масса жидкого полимера может находиться в диапазоне от приблизительно 20000 до 100000, например, от 70000 до 90000. In one embodiment, the number average molecular weight (Mn) of the resulting liquid polymer is within the range from about 10,000 to about 120,000, within the range of about 20,000 to about 110,000, or within the range of from about 25,000 to about 75,000 weight average molecular weight of the liquid polymer can be in the range of about 20,000 to about 100,000, e.g., from 70,000 to 90,000. Температура стеклования (Tg) жидкого полимера, например, находится в пределах диапазона от приблизительно - 100°С до приблизительно - 20°С, такого как в пределах диапазона от приблизительно - 95°С до приблизительно - 40°С или от приблизительно - 90°С до приблизительно - 50°С. The glass transition temperature (Tg) of liquid polymer, e.g., within the range from about - 100 ° C to about - 20 ° C, such as within the range of from about - 95 ° C to about - 40 ° C or from about - 90 ° C to about - 50 ° C. Жидкий полимер может иметь только одну температуру стеклования. The liquid polymer may have only one glass transition temperature. Поскольку остающиеся полимеры, имеющие живые концевые группы, используют в дальнейшем для получения слоя оболочки наночастиц, количество агента гашения активных центров также определяет количественное соотношение между жидким полимером и наночастицами в смеси наночастицы/жидкий полимер. Since the remaining polymers with living end groups, is used hereinafter for layer shell nanoparticles, the number of active centers of quenching agent also determines the proportion between the liquid polymer and nanoparticles in a mixture of nanoparticle / liquid polymer. Образование жидкого полимера завершается после частичного обрыва реакции при использовании агента гашения активных центров. liquid polymer formation is terminated after a partial termination reaction using active centers quenching agent. В иллюстративных способах, описанных в настоящем документе, после этого проводят добавление загрузки, которая начинает стадию синтеза наночастиц. In the illustrative methods described herein, the addition is carried out after this loading, which begins the nanoparticle synthesis step. В одном варианте реализации для стадии синтеза наночастиц в реакционную емкость сначала (то есть, до добавления моновинилароматического мономера и агента реакции сочетания) добавляют анионный инициатор. In one embodiment, for the nanoparticle synthesis step in the reaction vessel initially (i.e., prior to the addition of a monovinyl aromatic monomer and coupling agent) was added an anionic initiator. В других вариантах реализации инициатор также может быть добавлен в то же самое время, что и моновинилароматический мономер и агент реакции сочетания. In other embodiments, the initiator may also be added at the same time as the monovinyl aromatic monomer and coupling agent. Анионными инициаторами могут быть те соединения, которые описывались ранее. Anionic initiators may be those compounds which have been described previously. После добавления инициатора или одновременно с ним в ту же самую реакционную емкость, в которой получали жидкий полимер, добавляют моновинилароматический мономер и сшиватель. After addition of the initiator or concurrently with it in the same reaction vessel in which the obtained liquid polymer is added monovinylaromatic monomer and crosslinker. Живые полимерные цепи со стадии синтеза жидкого полимера сополимеризуются с моновинилароматическим мономером. The living polymer chains from the liquid polymer synthesis step copolymerize with the monovinylaromatic monomer. После этого цепи сополимера в углеводородном растворителе самоагрегируются с образованием мицелл. Thereafter, the copolymer chains in hydrocarbon solvent self-assemble to form micelles. Для сшивания мицелл используют сшиватель, что в результате приводит к получению наночастиц. For crosslinking using a crosslinker micelles, which results in obtaining nanoparticles. Необязательно стадия синтеза наночастиц может быть проведена в присутствии модификатора или регулятора 1,2-микроструктуры, таких как те соединения, которые описывались ранее. Optionally, the nanoparticle synthesis step may be conducted in the presence of a modifier or regulator 1,2-microstructure, such as those compounds described previously. В одном варианте реализации сополимерами являются двухблочные сополимеры, содержащие полисопряженный диеновый блок и моновинилароматический блок, такие как блочный поли(бутадиен-стирол). In one embodiment, the copolymers are diblock copolymers containing polyconjugated diene block and a monovinyl aromatic block such as a block of poly (butadiene-styrene). Моновинилароматические блоки обычно являются, по меньшей мере, частично сшитыми при использовании сшивателя. Monovinyl aromatic blocks are typically at least partially crosslinked using a crosslinker. В одном варианте реализации полимерные наночастицы сохраняют свою дискретную природу при прохождении незначительной или нулевой полимеризации между ними. In one embodiment, the polymer nanoparticles retain their discrete nature with little or no passage of polymerization therebetween. В некоторых вариантах реализации наночастицы являются по существу унимодальными и однородными по форме, в других вариантах реализации наночастицы характеризуются полимодальным распределением по размерам. In some embodiments, the nanoparticles are substantially unimodal and uniform in shape, in other embodiments, the nanoparticles are characterized polymodal size distribution. Сополимеризация цепей наночастиц может продолжаться настолько долго, насколько это будет необходимо, вплоть до получения желательных степени превращения мономера, степени полимеризации (СП) и/или молекулярной массы блочного полимера. The copolymerization of the nanoparticle chains may last as long as necessary, until a desired degree of monomer conversion, degree of polymerization (DP) and / or the molecular weight of the block polymer. Реакция полимеризации на данной стадии обычно может протекать в течение периода времени продолжительностью от приблизительно 0,5 часа до приблизительно 20 часов, от приблизительно 0,5 часа до приблизительно 10 часов или от приблизительно 0,5 часа до приблизительно 5 часов. The polymerization reaction in this step may typically take place over a period of time lasting from about 0.5 hour to about 20 hours, from about 0.5 hour to about 10 hours, or from about 0.5 hours to about 5 hours. Реакция полимеризации на данной стадии может быть проведена при температуре в диапазоне от приблизительно 30°F (-1,1°С) до приблизительно 300°F (148,9°С), от приблизительно 100°F (37,8°C) до приблизительно 250°F (121,1°С) или от приблизительно 150°F (65,6°C) до приблизительно 210°F (98,9°C). The polymerization reaction in this step may be carried out at a temperature ranging from about 30 ° F (-1,1 ° C) to about 300 ° F (148,9 ° C) of from about 100 ° F (37,8 ° C) to about 250 ° F (121,1 ° C) or from about 150 ° F (65,6 ° C) to about 210 ° F (98,9 ° C). Реакция полимеризации, используемая для получения полимерных наночастиц, может быть оборвана при использовании агента гашения активных центров. The polymerization reaction used to prepare the polymer nanoparticles may be torn off using the active centers quenching agent. Подходящие агенты гашения активных центров включают те соединения, которые описывались ранее. Suitable active centers quenching agents include those compounds which were described previously. В примерах вариантов реализации реакционную смесь наночастиц охлаждают и прикалывают в раствор изопропанол/ацетон, содержащий антиоксидант, такой как бутилированный гидрокситолуол (БГТ). In the examples of embodiments, the reaction mixture was cooled and dropwise nanoparticles in isopropanol / acetone solution containing an antioxidant such as butylated hydroxytoluene (BHT). Раствор изопропанол/ацетон может быть получен, например, в результате перемешивания 1 объемной части изопропанола и 4 объемных частей ацетона. A solution of isopropanol / acetone can be obtained, for example, by mixing 1 part by volume of isopropanol and 4 parts by volume of acetone. В одном варианте реализации синтез наночастиц проводят в том же самом растворителе, что и растворитель, использованный для синтеза жидкого полимера. In one embodiment, the nanoparticle synthesis is conducted in the same solvent as the solvent used for synthesizing the liquid polymer. Во время синтеза наночастиц жидкий полимер также может рассматриваться и в качестве растворителя. During nanoparticle synthesis the liquid polymer can also be considered as a solvent. Как можно себе представить без связывания себя теорией, во время синтеза наночастиц жидкий полимер также прослаивается между живыми полимерными цепями при участии последних в мицеллообразовании. As you can imagine, without binding by theory, during the synthesis of nanoparticles and liquid polymer sandwiched between the living polymer chains with the participation of the latter in the micellization. В результате это может привести к изолированию внутренней области мицеллы от углеводородного растворителя. As a result, it can lead to isolation of the internal field micelle from the hydrocarbon solvent. Следовательно, получающаяся в результате мицелла будет более стабильной, и шансы встречи и потенциального сшивания двух и более мицелл друг с другом, что в результате приведет к созданию намного более крупных частиц, уменьшатся. Consequently, the resulting micelle will be more stable and the chances of meeting and potential crosslinking two or more micelles with each other, which will result in the creation of much larger particles diminish. Жидкий полимер вызывает набухание получающейся в результате наночастицы, и получающаяся в результате смесь является более мягкой и легче примешиваемой к каучуковым композициям. The liquid polymer causes swelling of the resulting nanoparticles, and the resulting mixture is softer and easier to be admixed with the rubber compositions. Как можно себе представить без связывания себя теорией, во время синтеза наночастиц блок поли(сопряженного диена) в сопоставлении с моновинилароматическим блоком является более растворимым в выбранном углеводородном растворителе или смешиваемым с ним. As can be imagined without binding by theory, during the synthesis of nanoparticles of poly (conjugated diene) in comparison with the monovinyl aromatic block is more soluble in the selected hydrocarbon solvent, or miscible with it. Это облегчает последующее образование из цепей блок-сополимера мицелл и, в конечном счете, наночастиц. This facilitates the subsequent formation of the circuits of block copolymer micelles and ultimately nanoparticles. В зависимости от их смешиваемости полимерные цепи в растворе или суспензионной системе могут самоагрегироваться в домены различных структур. Depending on their miscibility of polymer chains in a solution or suspension system can be self-assembled into domains of various structures. Как можно себе представить без связывания себя какой-либо теорией, мицеллоподобная структура может быть получена в результате агрегирования цепей блок-сополимеров, содержащих блок поли(сопряженного диена) и ароматический блок. As can be imagined without binding ourselves to any theory, the micelle structure can be obtained by aggregating the block copolymer chains containing poly (conjugated diene) block and the aromatic block. Моновинилароматические блоки обычно устремлены к области центра мицеллы, а блоки, содержащие поли(сопряженный диен), обычно простираются от центра наружу. Monovinyl aromatic blocks are typically directed to the center region of the micelle, and the blocks containing the poly (conjugated diene), typically extend from the center outward. Наночастицы получают из сшитых мицеллярных структур, имеющих ядро, образованное из моновинилароматических блоков, и оболочку, образованную из блоков, содержащих поли(сопряженный диен). Nanoparticles prepared from cross-linked micelle structures having a core formed from a monovinyl aromatic blocks, and a shell formed of blocks comprising poly (conjugated diene). Как можно себе представить, сшиватели сшивают центральное ядро мицеллы, стабилизируя наночастицы и удерживая их от распада. As you can imagine, staplers crosslinked central core of the micelles, nanoparticles stabilizing and keeping them from decay. В одном примере жидким полимером смеси наночастицы/жидкий полимер является стирол-бутадиеновый сополимер. In one example the liquid polymer mixture nanoparticle / liquid polymer is a styrene-butadiene copolymer. Стирол-бутадиеновый сополимер характеризуется значением Mn в диапазоне приблизительно от 80000 до 120000 и содержит повторяющиеся звенья, которые получены из стирола в количестве в диапазоне от приблизительно 5 массовых процентов до приблизительно 95 массовых процентов и, соответственно, из 1,3-бутадиена в количестве в диапазоне от приблизительно 5 массовых процентов до приблизительно 95 массовых процентов, где повторяющиеся звенья, полученные из стирола и 1,3-бутадиена, расположены по существу в статистическом порядке. Styrene-butadiene copolymer has a Mn value in the range from about 80,000 to 120,000 and comprising recurring units which are derived from styrene in an amount ranging from about 5 weight percent to about 95 weight percent and, respectively, of 1,3-butadiene in an amount range from about 5 weight percent to about 95 weight percent, wherein repeating units derived from styrene and 1,3-butadiene are arranged substantially in a statistical manner. В данном примере в процессе жидкой полимеризации иллюстративных способов первый мономер представляет собой стирол, а второй мономер представляет собой бутадиен. 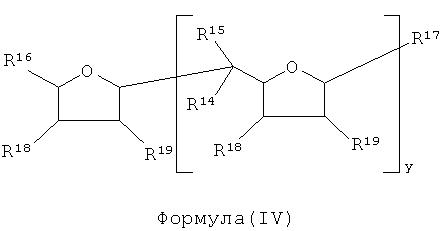 In this example, the process liquid polymerization exemplary methods first monomer is styrene and the second monomer is butadiene. Для некоторых областей применения предпочтительными являются процентные доли винила 50-60%, поскольку данный диапазон в результате приводит к получению совместимых фаз жидкий полимер/наночастицы. For certain applications, preferred are vinyl percentages 50-60%, because in this range results in a compatible phase liquid polymer / nanoparticle. Однако возможными также являются и боле низкие уровни содержания винила. However, the possibilities are also and a lower level of vinyl content. В еще одном примере жидкий полимер включает жидкий изопрен-бутадиеновый каучук (ИБК), характеризующийся значением Mn в диапазоне приблизительно от 35000 до 70000, который состоит из повторяющихся звеньев, которые получают из изопрена в количестве в диапазоне от приблизительно 5 массовых процентов до приблизительно 95 массовых процентов и, соответственно, из 1,3-бутадиена в количестве в диапазоне от приблизительно 5 массовых процентов до приблизительно 95 массовых процентов, где повторяющиеся звенья, произведенные из изопрена и 1,3-бутадиена, распо In another example, the liquid polymer comprises a liquid isoprene-butadiene rubber (CSI), characterized by Mn value in the range from about 35,000 to 70,000, which is comprised of repeat units which are derived from isoprene in an amount ranging from about 5 weight percent to about 95 weight percent and, respectively, of 1,3-butadiene in an amount ranging from about 5 weight percent to about 95 weight percent, wherein the repeating units derived from isoprene and 1,3-butadiene, Raspaud ожены по существу в статистическом порядке. ozheny essentially in a statistical manner. В данном примере в соответствии с описанными ранее иллюстративными способами первый мономер представляет собой изопрен, а второй мономер представляет собой бутадиен. In this example, in accordance with previously described exemplary methods first monomer is isoprene and the second monomer is butadiene. Полимерные наночастицы, синтезированные по однореакторным способам, описанным в настоящем документе, могут включать вулканизуемую оболочку и сшитое ядро. Polymer nanoparticles, synthesized by the one-pot methods described herein may include a vulcanizable shell and a crosslinked core. Мономеры, которые составляют оболочку, могут быть отверждаемыми в результате вулканизации при использовании серы или пероксида. The monomers which make up the shell may be curable by vulcanization to using sulfur or peroxide. Примеры подходящих серных вулканизаторов включают используемую «производителями резины» растворимую серу; Examples of suitable sulfur vulcanizing agents used include "rubber makers" soluble sulfur; элементарную серу (свободную серу); elemental sulfur (free sulfur); вулканизаторы, донирующие серу, такие как органосилановые полисульфиды, аминдисульфиды, полимерные полисульфиды или аддукты сера-олефин; vulcanizers donates sulfur, such as organosilane polysulfides, amindisulfidy, polymeric polysulfides or sulfur olefin adducts; и нерастворимую полимерную серу. and insoluble polymeric sulfur. Некоторые подходящие серные вулканизаторы описываются в патентах и публикациях предшествующего уровня техники, патенте США 6437050 (Bridgestone Corp.), и работе Macromol. Some suitable sulfur vulcanizing described in the patents and publications of the prior art, U.S. Patent 6437050 (Bridgestone Corp.), and the Macromol. Symp.118, 143-148 (1997). Symp.118, 143-148 (1997). В широком ассортименте вариантов реализации оболочка может быть образована из любого подходящего сопряженного диена или их смеси. In a wide range of embodiments the shell may be formed of any suitable conjugated diene or mixture thereof. Наиболее предпочтительными являются С 4 -С 8 1,3-сопряженные диеновые мономеры. Most preferred are the C 4 to C 8 1,3-conjugated diene monomers. Конкретные примеры мономеров оболочки включают нижеследующие, но не ограничиваются только этими: 1,3-бутадиен, изопрен (2-метил-1,3-бутадиен), цис- и транс-пиперилен (1,3-пентадиен), 2,3-диметил-1,3-бутадиен, 1,3-пентадиен, цис- и транс-1,3-гексадиен, цис- и транс-2-метил-1,3-пентадиен, цис- и транс-3-метил- 1,3-пентадиен, 4-метил-1,3-пентадиен, 2,4-диметил-1,3-пентадиен и тому подобное и их смесь. Specific examples of the shell monomers include, but are not limited to, 1,3-butadiene, isoprene (2-methyl-1,3-butadiene), cis and trans-piperylene (1,3-pentadiene), 2,3 dimethyl-1,3-butadiene, 1,3-pentadiene, cis- and trans-1,3-hexadiene, cis- and trans-2-methyl-1,3-pentadiene, cis- and trans-3-methyl-1 , 3-pentadiene, 4-methyl-1,3-pentadiene, 2,4-dimethyl-1,3-pentadiene and the like and mixtures thereof. В определенных вариантах реализации в качестве мономера оболочки используют изопрен или 1,3-бутадиен или их смесь. In certain embodiments, as the shell monomer is isoprene or 1,3-butadiene or a mixture thereof. Сшитое ядро наночастиц обычно получают в случае сшивания моновинилароматических мономеров при использовании сшивателя. A crosslinked core of the nanoparticles are generally prepared by sewing monovinyl monomers using a stapler. Массовое соотношение между моновинилароматическими мономерами и сшивателем в широком смысле может находиться в диапазоне от приблизительно 95:5 до приблизительно 0:100, от приблизительно 90:10 до приблизительно 25:75 или от приблизительно 85:15 до приблизительно 60:40. The weight ratio of monovinyl aromatic monomers and crosslinker broadly may range from about 95: 5 to about 0: 100, from about 90:10 to about 25:75 or from about 85:15 to about 60:40. Подходящие моновинилароматические мономеры включают нижеследующие, но не ограничиваются только этими: те соединения, которые в общем случае содержат от 8 до 20, предпочтительно от 8 до 12, атомов углерода, и могут быть выбраны, например, из: стирола; Suitable monovinyl aromatic monomers include, but are not limited to, those compounds generally contain from 8 to 20, preferably from 8 to 12 carbon atoms, and may be selected, for example, from: styrene; 1-винилнафталина; 1-vinylnaphthalene; 2-винилнафталина; 2-vinylnaphthalene; различных алкильных, циклоалкильных, арильных, алкиларильных или арилалкильных производных стирола, таких как, например, α-метилстирол, 3-метилстирол, 4-пропилстирол, 4-циклогексилстирол, 4-додецилстирол, 2-этил-4-бензилстирол, 4-п-толилстирол, 4-(4-фенилбутил)стирол, или их смесей. various alkyl, cycloalkyl, aryl, alkylaryl or arylalkyl derivatives of styrene such as, for example, α-methylstyrene, 3-methylstyrene, 4-propylstyrene, 4-cyclohexylstyrene, 4-dodecylstyrene, 2-ethyl-4-benzylstyrene, 4-p tolylstyrene, 4- (4-phenylbutyl) styrene, or mixtures thereof. В определенных вариантах реализации моновинилароматический мономер содержит стирол. In certain embodiments, the monovinyl aromatic monomer comprises styrene. В определенных вариантах реализации мицеллы, полученные в результате проведения полимеризации моновинилароматических мономеров и сопряженных диеновых мономеров, сшивают для улучшения однородности и неизменности формы и размера получающихся в результате наночастиц. In certain embodiments, the micelles obtained by polymerizing monovinyl aromatic monomers and conjugated diene monomers are crosslinked to improve the uniformity and invariability of the shape and size of the resulting nanoparticles. В таких вариантах реализации сшиватели включают полифункциональные сомономеры. In such embodiments, the crosslinking agents include polyfunctional comonomers. В определенных вариантах реализации приемлемыми являются сшиватели, которые являются, по меньшей мере, бифункциональными, у которых две функциональные группы способны вступать в реакцию с винилзамещенными ароматическими углеводородными мономерами. In certain embodiments, suitable are crosslinkers, which are at least difunctional in which the two functional groups capable of reacting with vinyl-substituted aromatic hydrocarbon monomers. Подходящие полифункциональные сомономеры представляют собой соединения, содержащие, по меньшей мере, 2, предпочтительно от 2 до 4 сополимеризуемых двойных связей углерод-углерод, например, диизопропенилбензол, дивинилбензол, дивиниловый эфир, дивинилсульфон, диаллилфталат, триаллилцианурат, триаллилизоцианурат, 1,2-полибутадиен, N,N'-м-фенилендималеимид, N,N'-(4-метил-м-фенилен)дималеимид и/или триаллилтримеллитат. Suitable polyfunctional comonomers are compounds having at least 2, preferably from 2 to 4 copolymerizable double carbon-carbon bonds, such as diisopropenylbenzene, divinylbenzene, divinyl ether, divinyl sulfone, diallyl phthalate, triallyl cyanurate, triallyl isocyanurate, 1,2-polybutadiene, N, N'-m-phenylenedimaleimide, N, N '- (4-methyl-m-phenylene) dimaleimid and / or triallyl trimellitate. Другие соединения, которые также могут быть использованы, представляют собой акрилаты и метакрилаты многоатомных, предпочтительно от двух- до четырехатомных С 2 -С 10 спиртов, например, этиленгликоля, 1,2-пропандиола, 1,4-бутандиола, 1,6-гександиола, неопентилгликоля, глицерина, триметилолпропана, пентаэритрита и сорбита. Other compounds which may be used are acrylates and methacrylates of polyhydric, preferably di- to chetyrehatomnyh C 2 -C 10 alcohols, e.g., ethylene glycol, 1,2-propanediol, 1,4-butanediol, 1,6-hexanediol , neopentyl glycol, glycerin, trimethylolpropane, pentaerythritol, and sorbitol. Также могут быть использованы и акрилаты и метакрилаты полиэтиленгликоля, содержащего от 2 до 20, предпочтительно от 2 до 8, оксиэтиленовых звеньев. May also be used, and polyethylene glycol acrylates and methacrylates containing from 2 to 20, preferably from 2 to 8, oxyethylene units. Примеры акрилатсодержащих сшивателей включают бисфенол А-этоксилатдиакрилат, (диэтиленгликоль)диакрилат, глицеринпропоксилаттриакрилат, поли(этиленгликоль)диакрилат и триметилолпропанэтоксилаттриакрилат. Examples of the acrylate crosslinkers include bisphenol A-etoksilatdiakrilat (diethylene glycol) diacrylate, glitserinpropoksilattriakrilat, poly (ethylene glycol) diacrylate and trimetilolpropanetoksilattriakrilat. Также могут быть использованы и сложные полиэфиры, образованные из алифатических ди- и/или полиолов, или же малеиновая кислота, фумаровая кислота и/или итаконовая кислота. They may also be used and polyesters formed from aliphatic di- and / or polyols, or else maleic acid, fumaric acid and / or itaconic acid. Полимерная наночастица, синтезированная в однореакторных способах, описанных в настоящем документе, может быть по существу сферической. The polymer nanoparticle synthesized in the one-pot methods described herein may be substantially spherical. Средний диаметр сфер в широком смысле может находиться в пределах диапазона от приблизительно 1 нм до приблизительно 200 нм, в пределах диапазона от приблизительно 5 нм до приблизительно 100 нм, в пределах диапазона от приблизительно 10 нм до приблизительно 80 нм или в пределах диапазона от приблизительно 15 нм до приблизительно 70 нм. The average diameter of spheres in a broad sense, may be in the range from about 1 nm to about 200 nm, within a range from about 5 nm to about 100 nm, within a range of from about 10 nm to about 80 nm or within the range from about 15 nm to about 70 nm. Среднюю молекулярную массу Mn блока поли(сопряженного диена) образованной оболочкой части можно регулировать в пределах диапазона от приблизительно 5000 до приблизительно 500000 или в пределах диапазона от приблизительно 5000 до приблизительно 200000, а наиболее предпочтительно в пределах диапазона от приблизительно 10000 до приблизительно 100000. Среднюю молекулярную массу Mn несшитого ароматического блока можно регулировать в диапазоне от приблизительно 5000 до приблизительно 500000, в пределах диапазона от приблизительно 5000 до приблизительно 200000 или в The average molecular weight Mn block poly (conjugated diene) formed by the shell parts can be adjusted within a range of from about 5,000 to about 500,000, or within the range of from about 5,000 to about 200,000, and most preferably within the range from about 10,000 to about 100,000 number average molecular mass Mn uncrosslinked aromatic block may be controlled in the range of from about 5,000 to about 500,000, within the range of from about 5,000 to about 200,000, or пределах диапазона от приблизительно 10000 до приблизительно 100000. within the range of from about 10,000 to about 100,000. Среднечисленную молекулярную массу (Mn) совокупной наночастицы можно контролируемо выдерживать в пределах диапазона от приблизительно 10000 до приблизительно 200000000, в пределах диапазона от приблизительно 50000 до приблизительно 1000000 или в пределах диапазона от приблизительно 100000 до приблизительно 500000. Полидисперсность (соотношение между средневесовой молекулярной массой и среднечисленной молекулярной массой) полимерной наночастицы можно контролируемо выдерживать в пределах диапазона от приблизительно 1 до приблизительно 1,5, в пределах ди The number average molecular weight (Mn) can be controlled nanoparticle aggregate kept within a range of from about 10,000 to about 200,000,000, within the range of from about 50,000 to about 1,000,000, or within the range from about 100000 to about 500000. The polydispersity (ratio of weight average molecular weight to number average molecular weight) of the polymer nanoparticle may be controlled to maintain a range from about 1 to about 1.5, within the di апазона от приблизительно 1 до приблизительно 1,3 или в пределах диапазона от приблизительно 1 до приблизительно 1,2. apazone from about 1 to about 1.3 or within the range of from about 1 to about 1.2. Значение Mn может быть определено при использовании гельпроникающей хроматографии (ГПХ), откалиброванной при помощи полистирольных стандартов и скорректированной на константы Марка-Хувинка для рассматриваемого полимера. The value of Mn can be determined using gel permeation chromatography (GPC), calibrated using polystyrene standards and adjusted for the Mark-Houwink constants for the polymer under consideration. Значения Mn, использующиеся в приведенных далее примерах, измеряли по методам ГПХ, откалиброванным при помощи линейных полимеров. Values ​​of Mn, used in the examples below were measured by GPC methods calibrated using linear polymers. В одном примере ядро синтезированных наночастиц является относительно твердым. In one example, the core of the synthesized nanoparticles is relatively hard. То есть, ядро характеризуется значением Tg, равным приблизительно 60°С и более. That is, the core is characterized by the value of Tg, of about 60 ° C or more. В еще одном примере наночастицы имеют ядро, которое является относительно более твердым в сопоставлении с оболочкой, например, характеризуясь значением Tg, по меньшей мере, приблизительно на 60°С большим, чем значение Tg слоя оболочки. In another example, nanoparticles have a core that is relatively harder as compared with the shell, for example, marked value Tg, of at least about 60 ° C greater than the Tg of the cladding layer. В одном примере слой оболочки является мягким. In one example, the shell layer is soft. То есть, слой оболочки характеризуется значением Tg, меньшим, чем приблизительно 0°С. That is, the shell layer is characterized by the value Tg, less than about 0 ° C. В одном варианте реализации значение Tg слоя оболочки находится в диапазоне от приблизительно 0°С до приблизительно - 100°С. In one embodiment, the Tg value of the coating layer is in the range from about 0 ° C to about - 100 ° C. Наночастицы, имеющие твердые ядра и мягкие оболочки, являются в особенности подходящими для использования при усилении резиновых смесей, использующихся для протекторов покрышек. Nanoparticles with hard cores and soft shells are particularly suitable for use in the amplification of the rubber compounds used for tire tread. Как известно специалистам в соответствующей области техники, значение Tg полимеров можно контролировать в результате выбора мономеров и их молекулярной массы, уровня содержания стирола и уровня содержания винила. As is known to those skilled in the relevant art, the Tg value of the polymer can be controlled by the choice of monomers and their molecular weight, the level of styrene content and vinyl content. Одна иллюстративная композиция, содержащая смесь жидкий полимер/наночастицы, также включает (а) каучуковую матрицу, (b) необязательное масло и (с) один или несколько компонентов, выбираемых из группы, состоящей из технического углерода, диоксида кремния, вулканизатора, ускорителя вулканизации, смолы, повышающей клейкость, антиоксиданта, жирных кислот, оксида цинка, воска, пептизатора, замедлителя подвулканизации, активатора, технологической добавки, пластификатора, пигментов и противоозоностарителя. One exemplary composition comprising a mixture of a liquid polymer / nanoparticle also includes (a) a rubber matrix, (b) an optional oil, and (c) one or more components selected from the group consisting of carbon black, silica, vulcanizing agent, vulcanization accelerator, tackifying resin, antioxidant, fatty acids, zinc oxide, wax, peptizer, scorch retarder, activator, processing additive, plasticizer, pigments and protivoozonostaritelya. На основе данной композиции могут быть изготовлены различные резиновые изделия, такие как покрышки и приводные ремни. On the basis of this composition can be produced various rubber products such as tires and belts. Смесь наночастицы/жидкий полимер может быть перемешана с каучуком по способам, в общем случае известным на современном уровне составления резиновых смесей, таким как перемешивание полимера каучуковой матрицы и смеси наночастицы/жидкий полимер с обычными количествами различных обычно использующихся материалов добавок при использовании стандартных оборудования и методик перемешивания каучука. The mixture nanoparticle / liquid polymer may be mixed with the rubber by methods generally known to date preparation of rubber compounds, such as polymer mixing rubber matrix and mixtures of nanoparticle / liquid polymer with conventional amounts of various commonly used additive materials, using standard equipment and techniques mixing rubber. Вулканизованное резиновое изделие может быть изготовлено из композиции настоящего изобретения в результате последовательного постадийного термомеханического перемешивания в резиносмесителе смеси наночастицы/жидкий полимер, полимера каучуковой матрицы и обычных количеств различных обычно использующихся материалов добавок с последующими профилированием и отверждением композиции. The vulcanised rubber article can be made from the composition of the present invention as a result of stepwise sequential thermomechanical mixing in mixer mixtures nanoparticle / liquid polymer rubber polymer matrix and conventional amounts of various commonly used additive materials and subsequent profiling and curing the composition. Из композиции, полученной из описанной ранее смеси наночастицы/жидкий полимер, могут быть изготовлены резиновые изделия, такие как покрышки. From the composition obtained from a mixture of nanoparticle / liquid polymer described above can be manufactured rubber articles such as tires. В этих целях ссылка может быть сделана, например, на публикацию США №2004/0143064 А1, которая посредством ссылки включается в настоящий документ. For this purpose, reference may be made, for example, U.S. publication №2004 / 0143064 A1, which is incorporated by reference herein. Полимеры, которые могут составлять каучуковую матрицу, включают натуральные и синтетические эластомеры. Polymers which may comprise the rubber matrix include natural and synthetic elastomers. Синтетические эластомеры обычно производят в результате проведения полимеризации сопряженных диеновых мономеров. Synthetic elastomers are generally produced by polymerizing conjugated diene monomers. Данные сопряженные диеновые мономеры могут быть сополимеризованы с другими мономерами, такими как винилароматические мономеры. These conjugated diene monomers may be copolymerized with other monomers such as vinyl aromatic monomers. Другие каучуковые эластомеры могут быть произведены в результате проведения полимеризации этилена совместно с одним или несколькими альфа-олефинами и необязательно одним или несколькими диеновыми мономерами. Other rubbery elastomers may be produced as a result of the polymerization of ethylene together with one or more alpha-olefins and optionally one or more diene monomers. Подходящие эластомеры включают натуральный каучук, синтетический полиизопрен, полибутадиен, сополи(изобутилен-изопрен), неопрен, сополи(этилен-пропилен), сополи(стирол-бутадиен), сополи(стирол-изопрен) и сополи(стирол-изопрен-бутадиен), сополи(изопрен-бутадиен), сополи(этилен-пропилен-диен), полисульфидный каучук, акриловый каучук, уретановый каучук, силиконовый каучук, эпихлоргидриновый каучук и их смеси. Suitable elastomers include natural rubber, synthetic polyisoprene, polybutadiene, copoly (isobutylene-isoprene), neoprene, copoly (ethylene-propylene), copoly (styrene-butadiene), copoly (styrene-isoprene), and copoly (styrene-isoprene-butadiene), copoly (isoprene-butadiene), copoly (ethylene-propylene-diene), polysulfide rubber, acrylic rubber, urethane rubber, silicone rubber, epichlorohydrin rubber, and mixtures thereof. Данные эластомеры могут демонстрировать наличие мириадов макромолекулярных структур, в том числе линейных, разветвленных и звездообразных. These elastomers may demonstrate the presence of the myriad of macromolecular structures including linear, branched and star-shaped. Масло в каучуковых композициях обычно использовали в качестве добавки, способствующей перемешиванию. The oil in rubber compositions normally used as an additive that promotes mixing. Примеры масла включают нижеследующие, но не ограничиваются только этими: ароматические, нафтеновые и/или парафиновые технологические масла. Examples of oils include, but are not limited to, aromatic, naphthenic and / or paraffinic processing oils. В некоторых примерах предпочтительным может оказаться использование масел, характеризующихся низким уровнем содержания полициклической ароматики (ПЦА), в частности, масел, которые характеризуются уровнем содержания ПЦА, меньшим чем 3%. In some instances it may be preferable to use oils characterized by low content of polycyclic aromatics (PCA), in particular oils, which are characterized by the content level of the OCA, less than 3%. В определенных вариантах реализации образованную жидким полимером часть описанной ранее смеси используют совместно с маслом, используют для замены части масла или используют для замены всего масла в резиновой смеси. In certain embodiments, the formed polymer liquid portion of the mixture is used together with the oil as described above, is used to replace part of the oil or used to replace the entire oil in the rubber mixture. Как таковое типичное количество масла в широком смысле может находиться в диапазоне от приблизительно 0 phr (ч./сто ч.) до приблизительно 100 phr (ч./сто ч. ), от приблизительно 0 phr (ч./сто ч.) до приблизительно 70 phr (ч./сто ч.) или от приблизительно более чем 0 phr (ч./сто ч. ), до приблизительно 50 phr (ч./сто ч. ), при расчете на 100 phr (ч./сто ч.) каучуковой матрицы в каучуковой композиции. As such, a typical amount of oil in the broadest sense can be in the range of from about 0 phr (hr. / Hundred hours.) To about 100 phr (hr. / Hundred hours.) From about 0 phr (hr. / Hundred hours.) To about 70 phr (hr. / hundred hours.) or from about greater than 0 phr (hr. / hundred hours.) to about 50 phr (hr. / hundred hours. ), based on 100 phr (hr. / hundred h.) of the rubber matrix in the rubber composition. Как должно быть понятно специалисту в соответствующей области техники, усиление резинового изделия может быть отражено низким деформационным динамическим модулем G', который может быть измерен в соответствии с документом ASTM-D 412 при 22°С. As will be appreciated by those skilled in the relevant art field, increasing the rubber product may be reflected low strain dynamic modulus G ', which can be measured in accordance with document ASTM-D 412 at 22 ° C. В определенных вариантах реализации усиление резиновых изделий, таких как покрышек, изготовленных из композиции настоящего изобретения, может быть достигнуто в результате (i) введения смеси наночастицы/жидкий полимер, (ii) частичной замены масла на смесь наночастицы/жидкий полимер; In certain embodiments, the reinforcement of rubber products such as tires made from compositions of the present invention can be achieved by (i) introducing a mixture of the nanoparticle / liquid polymer, (ii) a partial replacement for oil in a mixture of the nanoparticle / liquid polymer; или (iii) полной замены масла на смесь наночастицы/жидкий полимер. or (iii) complete replacement for oil mixture nanoparticle / liquid polymer. Смесь наночастицы/жидкий полимер придает различным резиновым изделиям улучшенное усиление и контролируемый гистерезис. The mixture nanoparticle / liquid polymer lends various rubber products improved reinforcement and controllable hysteresis. Под контролируемым гистерезисом понимается то, что в сопоставлении с ситуацией, когда в композиции присутствует масло, но никакой смеси наночастицы/жидкий полимер в композицию не включают, гистерезис увеличивается или уменьшается или ориентировочно остается неизменным. Under controlled hysteresis it is understood that in comparison with the situation where oil is present in the composition, but no nanoparticle mixture / polymer in the liquid composition does not comprise a hysteresis is increased or decreased, or remains roughly unchanged. Например, G' (МПа) может быть увеличен, по меньшей мере, приблизительно на 0,3, в альтернативном варианте, по меньшей мере, приблизительно на 1,5 или, по меньшей мере, на 3,0. For example, G '(MPa) may be increased by at least about 0.3, alternatively at least about 1.5 or at least 3.0. Потери энергии для эластомера называют гистерезисом, обозначая так разницу между энергией, приложенной для деформирования изделия, изготовленного из эластомера, и энергией, высвобожденной при возращении эластомера в свое первоначальное и недеформированное состояние. loss of energy called hysteresis for the elastomer, indicating so the difference between the energy applied to deform an article made of an elastomer and the energy released at the return of the elastomer to its original state and undistorted. Гистерезис характеризуется тангенсом потерь - тангенсом дельты (tan δ), который представляет собой соотношение между модулем потерь и модулем накопления (то есть, модулем вязкости и модулем упругости) согласно измерению в условиях приложенной синусоидальной деформации. Hysteresis is characterized by a loss tangent - tan delta (tan δ), which is the ratio between the loss modulus and the storage modulus (that is, viscous modulus and elastic modulus) as measured under conditions of applied sinusoidal deformation. Значение tan δ может быть измерено, например, при использовании пластометра ТА Instrument ARES Rheometer. The value of tan δ can be measured, e.g., using the rheometer TA Instrument ARES Rheometer. Резиновые изделия, характеризующиеся улучшенным усилением и подходящим гистерезисом, могут содержать смесь наночастицы/жидкий полимер, у которой phr соотношение между компонентом (а) жидкого полимера и компонентом (b) полимерных наночастиц находится в пределах диапазона от приблизительно 1:99 до приблизительно 99:1, в еще одном варианте реализации в пределах диапазона от приблизительно 20:80 до приблизительно 80:20, а в еще одном варианте реализации в пределах диапазона от приблизительно 25:75 до приблизительно 40:60. Rubber articles, characterized by improved reinforcement and suitable hysteresis may comprise a mixture of nanoparticle / liquid polymer, which phr ratio between the component (a) liquid polymer and component (b) polymer nanoparticles is within the range from about 1:99 to about 99: 1 in another embodiment in a range from about 20:80 to about 80:20, and in another embodiment within the range of from about 25:75 to about 40:60. Иллюстративные каучуковые композиции, описанные в настоящем документе, могут быть использованы для различных целей. The illustrative rubber compositions described herein can be used for various purposes. Например, они могут быть использованы для различных резиновых смесей, таких как протекторная резиновая смесь, резиновая смесь боковины покрышки или резиновые смеси других компонентов покрышки. For example, they can be used for various rubber compounds, such as the tread rubber composition, the rubber composition of the tire sidewall or other tire rubber mixture components. Такие покрышки могут быть изготовлены, профилированы, сформованы и отверждены по различным способам, которые известны и легко будут понятны специалистам в соответствующей области техники. Such tires can be manufactured, shaped, molded and cured by various methods which are known and will be readily apparent to those skilled in the art. В одном варианте реализации сформованную невулканизованную покрышку загружают в вулканизационную пресс-форму, а после этого вулканизуют до получения покрышки, базируясь на описанных ранее композиции и методике. In one embodiment, the molded unvulcanized tire is charged into a vulcanizing mold and then vulcanized to produce a tire, based on the composition and the method previously described. Следующие далее примеры включаются для представления специалистам в соответствующей области техники дополнительного руководства по реализации заявленного изобретения на практике. The following examples are included for presentation to those skilled in the art further by implementing the claimed invention in practice guide. Приведенные примеры демонстрируют просто представление работы, которая вносит свой вклад в положения настоящей заявки. These examples show just a representation of the work that contributes to the provisions of the present application. В соответствии с этим, данные примеры никоим образом не предполагают ограничения изобретения, определенного в прилагаемой формуле изобретения. Accordingly, these examples are in no way intended to limit the invention defined in the appended claims. В качестве реакционной емкости использовали реактор с рубашкой объемом в два галлона (7,57 дм 3 ). As the reaction vessel was used a jacketed reactor with a volume of two gallons (7.57 dm 3). Использовали следующие ингредиенты: 19,3%-ный раствор бутадиена в гексане, 33%-ный раствор стирола в гексане, гексан, н-бутиллитий (1,6 моль/л), олигомерный оксаланилпропан (ООП) (1,6 моль/л), изопропанол, бутилированный гидрокситолуол (БГТ) и 80%-ный дивинилбензол (ДВБ), приобретенный в компании Aldrich. The following ingredients were used: 19.3% solution of butadiene in hexane, 33% styrene in hexane, hexane, n-butyllithium (1.6 mol / l), oligomeric oksalanilpropan (PLO) (1.6 mol / l ), isopropanol, butylated hydroxytoluene (BHT) and 80% solution of divinylbenzene (DVB) purchased from the company Aldrich. В реактор последовательно загружали 4,96 фунта (2,25 кг) гексана, 0,59 фунта (0,27 кг) 33%-ного стирола и 3,58 фунта (1,62 кг) 19,3%-ного бутадиена. The reactor was sequentially charged with 4.96 pounds (2.25 kg) of hexane, 0.59 lbs (0.27 kg) of a 33% styrene and 3.58 pounds (1.62 kg) of 19.3% solution of butadiene. Данный реактор в течение приблизительно 15 минут нагревали до 120°F (48,9°C). This reactor for about 15 minutes heated to 120 ° F (48,9 ° C). При достижении в реакторе температуры 117°F (47,2°C) добавляли 2,3 мл н-бутиллития (1,6 моль/л) и 0,76 мл ООП (1,6 моль/л), разбавленных при помощи приблизительно 20 мл гексана. Upon reaching a reactor temperature of 117 ° F (47,2 ° C) was added 2.3 ml of n-butyllithium (1.6 mol / l) and 0.76 ml of OOP (1.6 mol / L) was diluted using about 20 ml of hexane. По истечении трех минут тепловыделение при полимеризации приводило к получению 126,7°F (52,6°С). After three minutes of heat in the polymerization afforded 126,7 ° F (52,6 ° C). По истечении одного часа рубашку реактора выставляли на 100°F (37,8°С) и добавляли 0,14 мл изопропанола. After one hour, the reactor jacket exposed to 100 ° F (37,8 ° C) and 0.14 mL of isopropanol was added. После скапывания образца для анализа в реактор добавляли дополнительное количество н-бутиллития (2,3 мл). After dripping of the sample for analysis in the reactor was added an additional amount of n-butyllithium (2.3 ml). Получали смесь 140,2 г стирольной смеси и 28,5 мл ДВБ, которую и добавляли в реактор. A mixture 140.2 g styrene blend and 28.5 ml of DVB, and which is added to the reactor. Температуру рубашки реактора увеличивали до 180°F (82,2°С). The jacket temperature was increased to 180 ° F (82,2 ° C). По истечении трех часов температуру реактора приводили к 90°F (32,2°C) и смесь скапывали в изопропанол, содержащий БГТ. After three hours, the reactor temperature was brought to 90 ° F (32,2 ° C) and the mixture was skapyvali in isopropanol containing BHT. После этого получающееся в результате твердое вещество отфильтровывали через марлю и высушивали на барабанной сушилке. Thereafter, the resulting solid was filtered through cheesecloth and dried on a drum drier. Образованная жидким полимером часть согласно определению характеризовалась значением Mn в диапазоне от 73000 до 80000. Образованная наночастицами часть согласно определению характеризовалась значением Mn 83700. Синтезированная смесь содержала 55% (масс.) жидкого полимера и 45% (масс.) наночастиц. Formed liquid polymer portion was characterized as defined Mn value in the range from 73000 to 80000. Nanoparticles formed portion according to the definition characterized by Mn value of 83700. The synthesized blend contained 55% (wt.) Of the liquid polymer and 45% (wt.) Of nanoparticles. В сопоставлении с ранее известными способами раздельного синтеза жидкого полимера смесь наночастицы/жидкий полимер было намного легче выделять из растворителя и высушивать. In comparison with previously known methods separate liquid polymer synthesis mixture nanoparticle / liquid polymer was much easier to isolate from solvent and dry. Однако при достаточном количестве наночастиц в смеси с жидким полимером после коагулироваания в результате получают по существу твердую смесь, которая может быть очень легко высушена на барабанной сушилке. However, a sufficient amount of the nanoparticles in admixture with the liquid polymer after koagulirovaaniya to yield a substantially solid mixture which can be easily dried by a drum drier. В соответствии с рецептурой, продемонстрированной в таблицах 1 и 2, получали шесть каучуковых композиций. 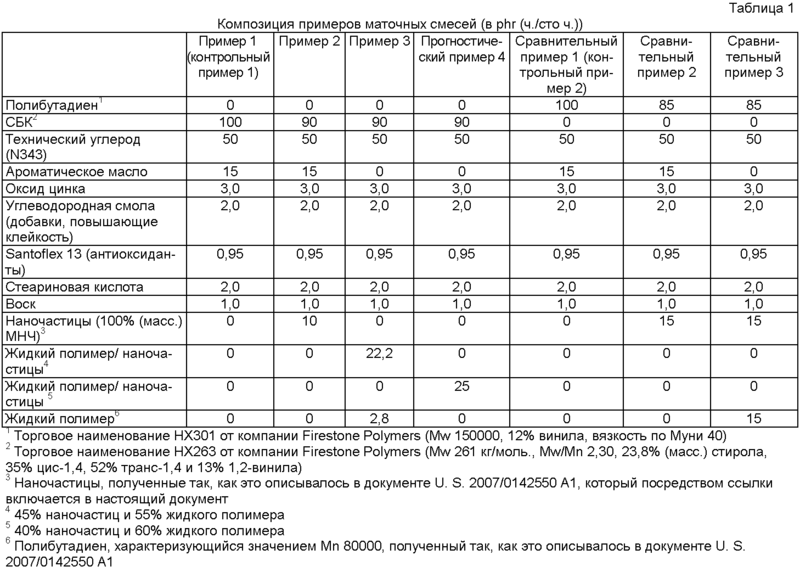 In accordance with the formulation shown in Tables 1 and 2 were prepared six rubber compositions. Первый пример являлся контрольным примером, который не содержал каких-либо наночастиц или жидкого полимера, и являлся образцом сравнения для сопоставления со смесями для испытаний. The first example was a control example that did not contain any nanoparticles or liquid polymer, and is a comparison example for comparison with the mixtures for testing. Второй пример получали при использовании синтезированных наночастиц для замены в рецептуре смеси 10 phr (ч./сто ч.) стирол-бутадиенового каучука (СБК). A second example was prepared using synthesized nanoparticles to replace in the mixture formulation of 10 phr (hr. / Hundred hours.) Styrene-butadiene rubber (SBR). Третий пример получали при использовании наночастиц и жидкого полимера для замены 10 phr (ч./сто ч.) СБК и приблизительно 15 phr (ч./сто ч.) ароматического масла. The third example was prepared using nanoparticles and liquid polymer to replace 10 phr (hr. / Hundred hours.) SBR and about 15 phr (hr. / Hundred hours.) Of an aromatic oil. Вследствие содержания в синтезированной смеси МНЧ/ЖП (мицеллярные наночастицы/жидкий полимер) 55% (масс.) жидкого полимера и 45% (масс.) наночастиц для достижения правильного соответствия желательной композиции использовали 22,2 phr (ч./сто ч.) смеси МНЧ/ЖП и 2,8 phr (ч./сто ч.) дополнительного количества ЖП. Because content in synthetic mixture IPM / LQ (micellar nanoparticle / liquid polymer) of 55% (wt.) Of the liquid polymer and 45% (wt.) Of the nanoparticles to achieve proper compliance desired composition used 22,2 phr (hr. / A hundred hours). mixture IPM / gallbladder and 2,8 phr (hr. / hundred hours.) additional quantities of GB. Для иллюстрирования того, что дополнительное количество ЖП не представляет собой обязательный компонент в примерах, описанных в настоящем документе, также приведен и четвертый прогностический пример. To illustrate that the additional amount of the gallbladder is not a necessary component of the examples described herein, and also shows the fourth example of the prognostic. В прогностическом примере 4 используют 25 phr смеси МНЧ/ЖП с составом 40:60. The prognostic Example 4 using 25 phr mixture IPM / LQ with a composition of 40:60. В данном прогностическом примере 10 phr СБК заменяют на 10 phr примешанных МНЧ и 15 phr ЖП заменяют на 15 phr примешанного ЖП без использования дополнительного количества ЖП самого по себе. This prognostic Example 10 phr SBR is replaced by 10 phr admixed IPM and 15 phr LQ is replaced by 15 phr admixed gallbladder without using additional amounts of the gallbladder itself. Также получали и три сравнительных примера. Also prepared and three comparative examples. В каждом из данных примеров используют полибутадиен в качестве матрицы и используют наночастицы, которые синтезировали в реакторе, отдельном от реактора синтеза жидкого полимера. In each of these examples use polybutadiene as the matrix and use nanoparticles that were synthesized in a reactor separate from the liquid polymer synthesis reactor. Сравнительный пример 1 содержал 15 phr ароматического масла, но не содержал каких-либо наночастиц или жидкого полимера. Comparative Example 1 contained 15 phr of aromatic oil, but did not contain any nanoparticles or liquid polymer. Сравнительный пример 1 использовали в качестве контрольного примера (контрольный пример 2), а результаты других сравнительных примеров нормализовали по отношению к сравнительному примеру 1. Сравнительный пример 2 отличается от сравнительного примера 1 тем, что в нем 15 phr полибутадиена заменяют на 15 phr наночастиц. Comparative Example 1 was used as a control example (Comparative Example 2), and the results of other comparative examples were normalized in relation to Comparative Example 1. Comparative Example 2 is different from Comparative Example 1 in that it replaces 15 phr of polybutadiene 15 phr of nanoparticles. Сравнительный пример 3 отличается от сравнительного примера 1 тем, что в нем 15 phr полибутадиена и 15 phr ароматического масла заменяют на 15 phr наночастиц и 15 phr бутадиенового жидкого полимера. Comparative Example 3 differs from Comparative Example 1 in that it 15 phr of polybutadiene and 15 phr of aromatic oil was replaced with 15 phr of nanoparticles and 15 phr of butadiene liquid polymer. В каждом примере смесь ингредиентов замешивали по способу, приведенному в таблице 3. Конечную смесь раскатывали в лист и формовали в течение 15 минут при 165°С. In each example, a mixture of the ingredients was kneaded by the method described in Table 3. The final mixture was rolled into a sheet and molded for 15 minutes at 165 ° C.
Измерение сопротивления разрыву при растяжении и потерь при гистерезисе проводили для примеров вулканизованных каучуковых композиций. Measurement of tensile strength and tensile hysteresis losses in the examples was performed for vulcanized rubber compositions. Результаты продемонстрированы в таблице 4. Измерение сопротивления разрушению при растяжении проводили в соответствии с документом ASTM-D 412. The results are shown in Table 4. Measurement of fracture resistance in tension performed according to the document ASTM-D 412. Для примеров 1, 2 и 3 геометрия образца для испытания имела форму кольца с шириной 0,05 дюйма (1,3 мм) и толщиной 0,075 дюйма (1,9 мм). For Examples 1, 2 and 3, the geometry of the test piece had the shape of a ring with a width of 0.05 inches (1.3 mm) and a thickness of 0.075 inches (1.9 mm). Испытание для образца проводили при расчетной рабочей длине образца 1,0 дюйма (25,4 мм). The test sample was carried out at the calculated working length of the sample of 1.0 inch (25.4 mm). Потери при гистерезисе измеряли при использовании анализатора Dynastat Viscoelastic Analyzer при установке частоты 1 Гц и деформации 1%. With hysteresis loss measured using a Dynastat Viscoelastic Analyzer analyzer when installing a frequency of 1 Hz and 1% strain. Геометрия образца для данного испытания представляла собой цилиндр с длиной 15 мм и диаметром 10 мм. sample geometry for the test was a cylinder of 15 mm in length and 10 mm in diameter. Для примеров 5, 6 и 7 геометрия образца для испытания имела форму кольца с шириной 0,05 дюйма (1,3 мм) и толщиной 0,075 дюйма (1,9 мм). For Examples 5, 6 and 7 the test specimen geometry was in the form of the ring with a width of 0.05 inches (1.3 mm) and a thickness of 0.075 inches (1.9 mm). Испытание для образца проводили при расчетной рабочей длине образца 1,0 дюйма (25,4 мм). The test sample was carried out at the calculated working length of the sample of 1.0 inch (25.4 mm). Потери при гистерезисе измеряли при использовании пластометра ТА Instrument ARES Rheometer. With hysteresis loss measured using a rheometer TA Instrument ARES Rheometer. Геометрия образца для испытания имела форму цилиндра с длиной 15 мм и диаметром 9 мм. The geometry of the test piece had the shape of a cylinder with a length of 15 mm and a diameter of 9 mm. Использовали следующие условия проведения испытания: частота 5 Гц, деформация 1%. We used the following test conditions: frequency 5 Hz, 1% strain. Несмотря на иллюстрирование и описание изобретения типичными вариантами реализации, его не предполагается ограничивать продемонстрированными деталями, поскольку без какого-либо отклонения от сущности настоящего изобретения могут быть произведены и различные модификации и замещения. Although illustration and description of typical embodiments of the invention, it is not intended to limit demonstrated by the items because without departing from the spirit of the present invention can be produced, and various modifications and substitutions. Как таковые дополнительные модификации и эквиваленты изобретения, описанные в настоящем документе, для специалистов в соответствующей области техники могут обнаружиться при использовании не более чем стандартных экспериментов, и все такие модификации и эквиваленты, как можно себе представить, соответствуют объему и сущности изобретения, определенного в следующей далее формуле изобретения. As such, further modifications and equivalents of the invention described herein, those skilled in the art can be found out using no more than routine experimentation, and all such modifications and equivalents as can be imagined within the scope and spirit of the invention as defined in the following further claims. при этом наночастицы образуются в результате самоагрегирования в мицеллы и сшивания мицелл полифункциональным сомономером. wherein the nanoparticles are formed by self assembly into micelles and micelle crosslinking polyfunctional comonomer. 2. Способ по п.1, где агент гашения активных центров частично обрывает полимеризацию, так что обрыву подвергаются от 20 до 95% полимерных цепей. 2. The method of claim 1, wherein the active centers quenching agent partially terminates the polymerization such that undergo breakage from 20 to 95% of the polymer chains. 3. Способ по п.1, дополнительно содержит стадию фильтрования и высушивания в барабанной сушилке синтезируемой в одном реакторе смеси наночастиц и жидкого полимера. 3. The method of claim 1, further comprising the step of filtering and drying in a drum dryer synthesized in one reactor a mixture of nanoparticles and liquid polymer. 4. Способ по п.1, где сшиватель выбирают из группы, состоящей из диизопропенилбензола, дивинилбензола, дивинилового эфира, дивинилсульфона, диаллилфталата, триаллилцианурата, триаллилизоцианурата, 1,2-полибутадиена, N,N'-м-фенилендималеимида, N,N'-(4-метил-м-фенилен)дималеимида и/или триаллилтримеллитата, акрилатов и метакрилатов многоатомных С 2 -С 10 спиртов, акрилатов и метакрилатов полиэтиленгликоля, содержащего от 2 до 20 оксиэтиленовых звеньев, и сложных полиэфиров, образованных из алифатических ди- и/или полиолов, или малеиновой кислоты, фум 4. The method of claim 1, wherein the crosslinker is selected from the group consisting of diisopropenylbenzene, divinylbenzene, divinyl ether, divinyl sulfone, diallyl phthalate, triallyl cyanurate, triallyl isocyanurate, 1,2-polybutadiene, N, N'-m-phenylenedimaleimide, N, N ' - (4-methyl-m-phenylene) dimaleimida and / or triallyl trimellitate, acrylates and methacrylates of polyhydric C 2 -C 10 alcohols, acrylates and methacrylates of polyethylene glycol having from 2 to 20 oxyethylene units and polyesters formed from aliphatic di- and / or polyols, or maleic acid, fum ровой кислоты и/или итаконовой кислоты. rovoy acid and / or itaconic acid. 5. Способ по п.4, где сшивателем является дивинилбензол. 5. The method of claim 4, wherein crosslinker is divinylbenzene. 6. Способ по п.1, где первым мономером является бутадиен, а вторым мономером является стирол. 6. The method of claim 1, wherein the first monomer is butadiene and the second monomer is styrene. 7. Способ по п.1, где ядро наночастицы характеризуется значением Tg, равным приблизительно 60°C и более. 7. The method of claim 1, wherein the nanoparticle core is characterized by the value of Tg, of about 60 ° C or more. 8. Способ по п.1, где оболочка наночастицы характеризуется значением Tg, меньшим чем приблизительно 0°C. 8. The method of claim 1, wherein the nanoparticle shell is characterized by the value of Tg, less than about 0 ° C.
9. Способ по п.1, где оболочка наночастицы характеризуется значением Tg в диапазоне от приблизительно 0°C до приблизительно 70°C. 9. The method of claim 1, wherein the nanoparticle shell is characterized Tg value in the range from about 0 ° C to about 70 ° C.
10. Способ по п.1, где ядро наночастицы характеризуется значением Tg, по меньшей мере, приблизительно на 60°C большим, чем значение Tg оболочки. 10. The method of claim 1, wherein the nanoparticle core is characterized by the value of Tg, of at least about 60 ° C greater than the Tg of the shell. 11. Способ по п.1, где жидкий полимер характеризуется значением Mw в диапазоне от приблизительно 10000 до приблизительно 120000. 11. The method of claim 1, wherein the liquid polymer has a Mw value in the range from about 10,000 to about 120,000. 12. Способ по п.11, где наночастицы имеют ядро, содержащее стирол и сшитое при использовании дивинилбензола, и оболочку, содержащую бутадиен. 12. The method of claim 11, wherein the nanoparticles have a core comprising styrene and crosslinked using divinylbenzene and a shell comprising butadiene. 13. Способ по п.1, где сшиватель добавляют до инициатора полимеризации и моповинилароматического мономера. 13. The method of claim 1, wherein the crosslinker is added to the polymerization initiator and monomer mopovinilaromaticheskogo. 14. Способ по п.1, где агент гашения активных центров выбирают из группы, состоящей из метанола, этанола, пропанола и изопропанола. 14. The method of claim 1, wherein the active centers quenching agent is selected from the group consisting of methanol, ethanol, propanol and isopropanol. 15. Способ по п.1, где агентом гашения активных центров является функционализующий агент. 15. The method of claim 1, wherein the active centers quenching agent is a functionalizing agent. 16. Способ по п.15, где функционализующим агентом является тетрахлорид олова. 16. The method of claim 15, wherein the functionalizing agent is tin tetrachloride. 17. Способ по п.1, где полимеризацию или сополимеризацию стадии (а) инициируют при использовании анионного инициатора. 17. The method of claim 1 wherein the polymerization or copolymerization of step (a) is initiated by using an anionic initiator. 18. Способ по п.1, где стадии проводят в одной и той же реакционной емкости. 18. The method of claim 1 wherein step is carried out in the same reaction vessel. добавление смеси к каучуковой композиции. adding the mixture to the rubber composition. конструирование покрышки при использовании данного протектора покрышки. designing a tire by using this tire tread. где наночастицы диспергированы и перемешаны внутри жидкого полимера. wherein the nanoparticles are dispersed and blended within the liquid polymer. 22. Композиция веществ по п.21, где наночастицы и жидкий полимер присутствуют с соотношением в диапазоне от 25:75 до 40:60. 22. The composition of matter of claim 21, wherein the nanoparticles and liquid polymer are present in a ratio from 25:75 to 40:60. NL8304029A (en) 1983-11-23 1985-06-17 Dow Chemical Nederland Rubber-reinforced polymers of monovinylidene aromatic compounds having a very good balance between gloss and strength properties and a process for their preparation. DE3587828D1 (en) 1984-07-26 1994-06-23 Kanegafuchi Chemical Ind A crosslinkable polymer composition. BE1008739A3 (en) * 1994-01-12 1996-07-02 Kanegafuchi Chemical Ind Method of preparation of polymer isobutylene. ES2205961B2 (en) 2001-02-13 2005-03-01 Eads Construcciones Aeronauticas, S.A. Process for manufacturing elements of composite material by the co-bonding tecnoclogia.